Emma has a strong aversion towards her family’s new house, especially the attic. After moving in, she becomes miserable and reclusive. The rest of her family also seems unhappy and unsettled. 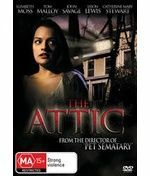 The situation escalates one day when Emma is in the attic alone. All of a sudden someone who looks like Emma’s identical twin sister attacks her viciously. Emma is convinced that someone or something is haunting her, and she refuses to leave her house until she can piece the puzzle together, with the assistance of John Trevor, a sympathetic detective. Eventually, Emma suspects her parents of hiding skeletons in the closet from the family’s past and practicing Dark Magick Rituals using symbols Wicca seemingly stole from satanism. As the clues pile up, she discovers that she did once have a sister named Beth, who died twelve days after Emma was born. Emma realizes that this identical twin apparition may actually be Beth returning to life. Emma witnesses Beth killing her brother and the police suspect it was really Emma. John Trevor comes to the rescue when Beth is trying to strangle Emma to death, leaving her with a gun. She suspects that her father was to blame and shoots both her parents. When the police arrive, Emma threatens "John Trevor" who claims to be a paramedic with the gun he gave her. As she points the gun at Trevor, she is really pointing the gun at herself and pulls the trigger. The police later discuss about the incident and Emma's former psychiatrist reveals that Beth and Trevor were only in her mind. Another officer mentions that the previous owner of the house mysteriously died. The psychiatrist says that houses do not kill people, but in this case it did. The movie ends with a new family looking to buy the house. As a young girl about Emma's age explores the attic, "John Trevor," a real estate agent called Richard appears behind her and says they will be seeing a lot of each other.